Have you "noticed" our Noticeboard yet? There is now an easy way to get your name down for various events, relays etc. - simply visit our virtual noticeboard and add your name to the event you're interested in by filling in a short form. Your name will then appear on a list below the event for you, your team mates and your team manager to see. As much as we all love FB, it's sometimes difficult to keep tabs on all the posts on there! At our AGM on Monday (8/4/19), we had names proposed and accepted for our main committee posts (chairman Jeff Southern, secretary Val Baxter, treasurer Shannel Curtis, welfare officers Stephanie Young and Stephen Heywood) but we still have vacancies for a number of roles in the club, including the club captains (aside from the U15 boys, Chris Perkins). Any interested parties are invited to email Val. The Early Bird membership renewal rates will be ending on April 30th as previously publicised. We also passed a vote on a proposal at the AGM, to impose a late payment penalty for members who have not renewed their membership fees within a month of the due date - this will be an additional amount per membership (£5 per junior membership, £10 per adult and £15 per family) for any memberships not paid by 31st May (this year). This decision was not taken lightly, but late payments create a lot of extra admin work (composing and sending reminder emails/letters and making numerous separate registrations with EA, all of which are very time consuming) and puts a lot of pressure on volunteers who already have a heavy workload for the club, not to mention causing major problems with race entries as many organisers (and definitely the track and field leagues (both junior and senior) and NEGP) insist on a current EA registration, which won't be made until membership is renewed. Many other clubs in the area have similar penalties in place, for the same reasons. Please take advantage of the early bird offer, to save yourself some money and the club volunteers their time and effort! Many thanks to those members who have already paid, it's much appreciated. Next year, renewals will be at the normal rate up until 30th April (£35, £60 and £95) and then the late penalty will be incurred from 1st May onwards. Club Outing to Lancaster & Morecambe Open Track & Field Meeting - 6th May. Free transport provided! This year our club Track and Field Trip away day is going to Lancaster and Morecambe AC Open Medal Meeting at Salt Ayre Leisure Centre, Lancaster LA1 5JS. 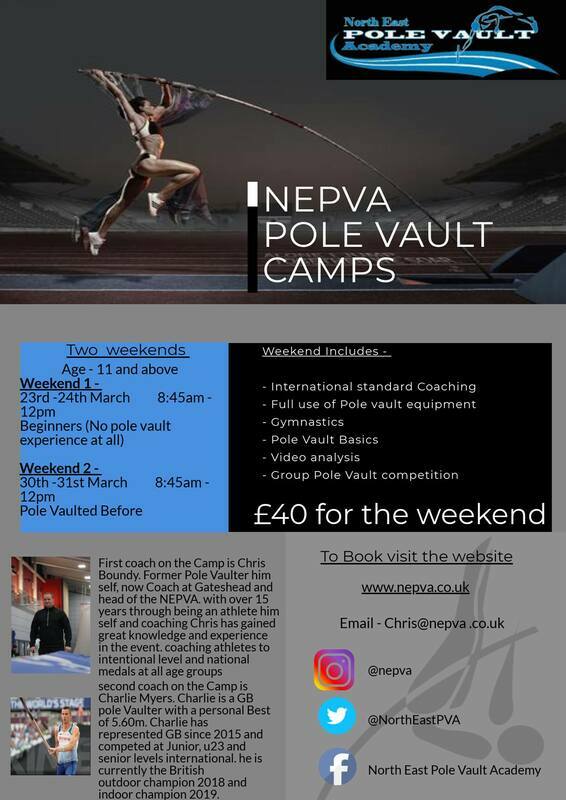 The club (Birtley AC) are providing free coach transport to the venue which has events for U9s through every age category to seniors (that includes masters athletes too, no excuses!). 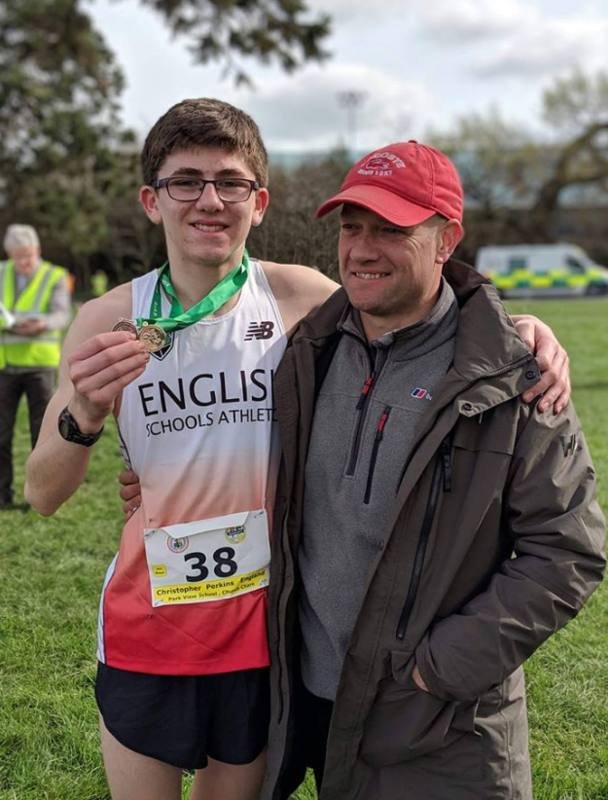 Chris Perkins made a brilliant first outing in his England vest at the SIAB (Schools' International Athletic Board) XC International in Dublin, romping home in third place to help bring the England team to victory. Chris, who is still not back to 100% fitness after a viral infection last week, is showing a lot of promise, and it seems likely that this won't be his last outing in an England vest! Six Birtley AC athletes all boarded the Durham Team coach on Saturday for a relatively early morning trip to Leeds to take part in the English Schools Cross Championships. 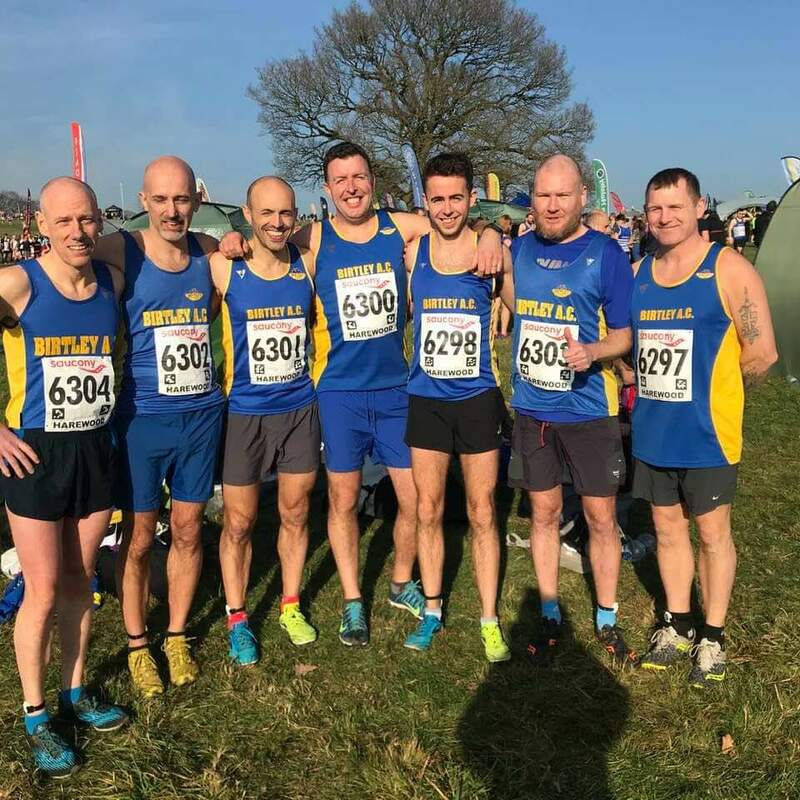 Those six Birtley athletes competed in all championship age groups with the exception of Intermediate Boys, a fantastic achievement for the club. Temple Newsam Park in Leeds was holding the Championships for the second year in succession so the course was familiar to some making a return. The weather, as forecast, was dreadful with incessant rain and a gusty wind but this would not dent the spirit of the athletes who had all worked so hard for their selection. They were all determined to enjoy their day. The course was hilly and run, generally, on well cut grass fields forming the grounds of Temple Newsam House. The course, however, was soon to cut up and by the last race was very heavy underfoot with extremely tricky downhill sections where even long spikes did not guarantee a ‘slip free’ descent. The day began with Tess Graham in the Intermediate Girls Championship run over a distance of 3710m. Tess had a really solid run finishing in 117th position out of 341 competitors and was Durham’s fifth girl home. Tess still has another year in this age category. Next up was Chris Perkins in the Junior Boys Championship competing over a distance of 4100m. Chris had a great start and was soon occupying what is becoming a familiar position at the front of the race along with his local rival Josh Blevins along with another athlete known to Chris, Lewis Sullivan from Suffolk. It was a three-horse race until the beginning of the second longer lap, at which point Lewis pulled into an unassailable lead, with Josh clear in second. Chris was occupying a comfortable third place but it was clear that there were a number of runners who appear to have left something in the tank for a final push to the line. On a difficult uphill finish, Chris relinquished three places but finished in an excellent 6th place to claim his first England vest - a fantastic achievement. Chris with his coach Gary Curtis, proudly showing off his England vest. The Junior Girls were up next with both Katie Francis and Abigail Thwaites competing over the 3000m course. Katie did not get the best of starts, possibly due to her diminutive stature but she quickly started moving through the field, eventually finishing in 19th place and first counter for Durham - a fantastic run. Abigail, on a course that was perhaps not to her strengths, dug deep to finish in 307th position . Both girls have had brilliant cross-country seasons. At 2.35, it was the turn of the Senior Girls with Birtley’s sole representative, Eve Southern, competing in her first English Schools Final. Its great to see that after so many near misses, Eve finally got her chance and she wasn’t going to let anything spoil her day. Due to the pen system at the start, Eve was not able to get off to her usual positive start but the 4100m course would provide plenty opportunity for her to work steadily through the field. This she did and finished in a creditable 237th position. In the final race of the day Ollie Barret was competing in the Senior Boys Championship having only taken up running seriously last Autumn. The course was extremely heavy going at this stage and Ollie was not the only boy having difficulty with their footing. In the longest race of the day, run over 6700m, Ollie did well to stay upright and finished in 288th place and sixth counter for Durham. For all those who competed, the day was a fantastic experience with every single Birtley athlete doing themselves, their County and Club extremely proud. A big thank you to all of the parents who made the journey to support and also to Gary and Shannel for their support on the day but also throughout the season. Cross-country wasn't the only event this weekend - the NECAA Indoor Pentathlon Championships were also taking place (in somewhat warmer, drier conditions!). 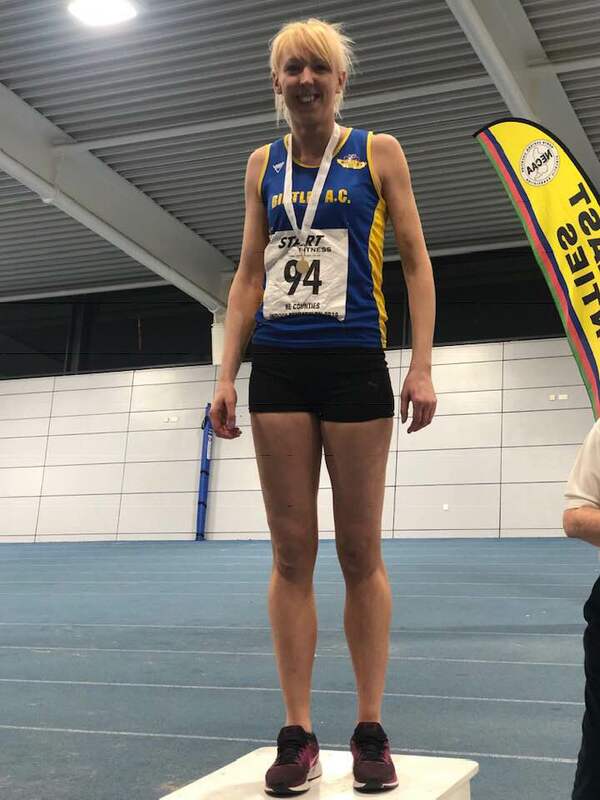 Young athlete Amy Drummond was competing in her very first pentathlon, and she PB'ed in almost every event - well done Amy! 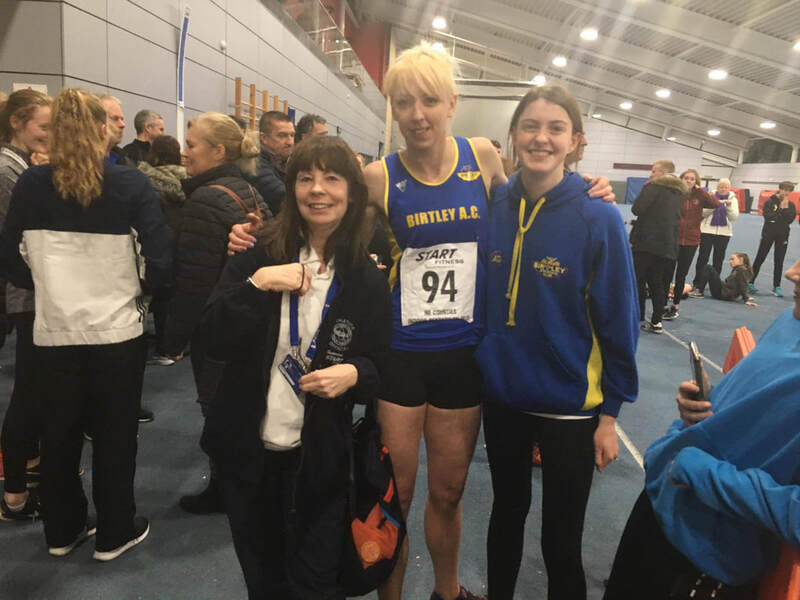 Reigning pentathlon champ Rebecca alongside Amy Drummond and our very own official Carole Ward. Junior Relays - Your club needs YOU on Sunday 10th March! 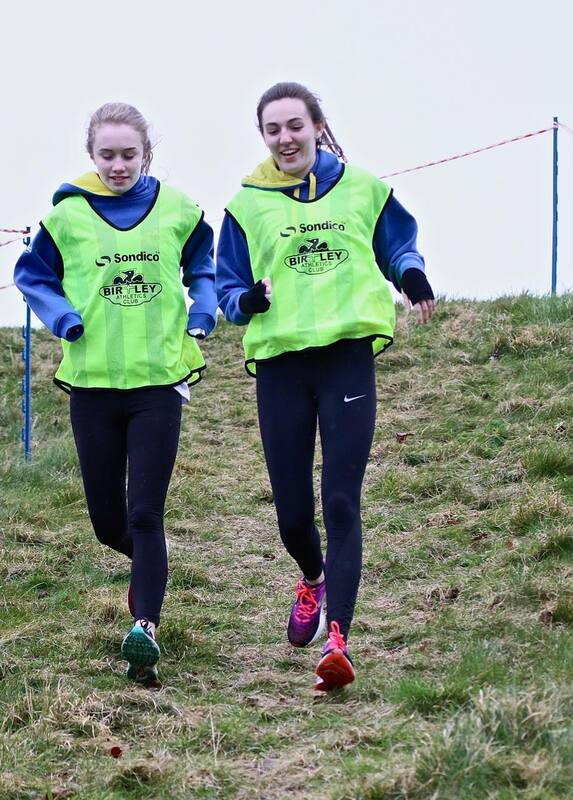 Young athletes - this is your last chance to run cross-country this season, with a home ground advantage! Parents and older athletes - please step up and help out with set-up, marshalling, and other duties - you'll still be able to support your child! Other clubs - if you haven't signed up your young athletes for this event yet, now's your chance! Full details and an online entry form here. ANNUAL GENERAL MEETING - YOUR CLUB NEEDS YOU! The Birtley AC AGM will be held at 7pm on Monday 8th April 2019 at the Birtley Hub. Decisions about future membership fees, setting of nightly subs, and voting in of committee members will all take place, so it's vital that you come along and have your say - all members are eligible to vote on these important issues. If there are any issues that you would like to see on the agenda, please email by April 1st for consideration by the committee. There will be a list of key committee posts available for nominations prior to the AGM, please consider volunteering for some of these roles as the club cannot function without our members's support. This link will take you to the nominations list which will allow you to volunteer yourself or nominate (or second) others - please take the time to have a look at the list and help your club. To enter a name, simply type it in the appropriate column - the document will automatically save. Thank you for your help! Mighty Molly hits the heights again! Massive shout-out for Molly Elliott a very well deserved Bronze Medal and another PB! Very close to Silver with her biggest jump ever, making it a fantastic result in the English Championships!! 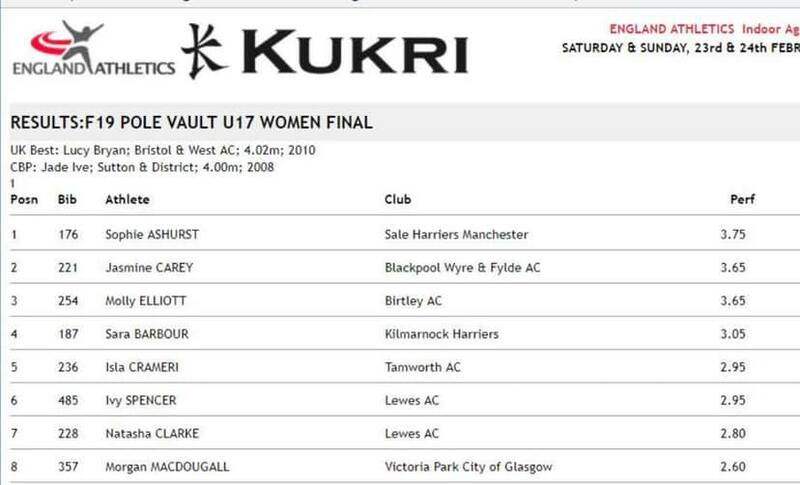 While all eyes have been on the National XC at Leeds, there's another National Championship taking place down the road at Sheffield; the England Athletics Age Group Indoor Championships is taking place this weekend, and Molly Elliott is entered in the pole vault tomorrow (24th Feb) at 10.30am. The event will be streamed live on runjumpthrow.com, so why not sit down with a cuppa and cheer her on from the comfort of home?